An upsurge of interest in Mediterranean roots traditions highlights a particular challenge in the Maltese case. Situated south of Sicily, possessing numerous world heritage sites and the largest natural harbor in the Mediterranean, Malta has long been a stepping stone between North Africa and southern Europe. Maltese (a Semitic language related to Arabic, Aramaic and Hebrew, but written in Latin script) likewise reflects the island's complex cultural history as a vibrant maritime crossroads. But British colonial rule and a censorious Catholic clergy disparaged local folk traditions, so the extensive ethnomusicology of nearby Italy, for instance, never occurred in Malta. Local cultural history thus presents a conundrum to artists today who seek inspiration in the Maltese folk heritage. Enter Etnika, a group seeking to recuperate Maltese folk instrumental music. While ghana (pronounced "anna"; the "gh" is silent) folk song can still be heard at weddings, funerals and other celebrations, by the mid-20th century the instrumental traditions of shepherds, farmers, fishermen and workers were giving way to European instruments. 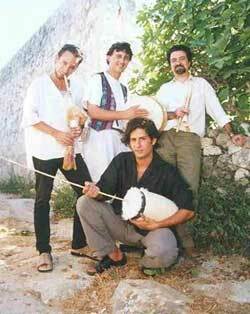 So in a society long conditioned to repudiate the uniqueness of Maltese culture, Etnika's recovery of folk instruments has sparked popular interest by weaving together island and regional traditional strains with classical European influences and a variety of contemporary genres from rock to electronica. In England Maltese researcher and world music enthusiast Steve Borg stumbled upon 16 Maltese folk melodies, airs and dances transcribed and published in 1807 by Edward Jones, harp master and bard to His Royal Highness the Prince of Wales. (Aficionados take note: Jones, an ethnomusicologist before his time, collected some 500 transcriptions of folk tunes from around the world.) Borg also browsed 18th- and 19th-century travelogues for musical descriptions and tapped the archives of the Maltese state radio, where he found mid-20th-century recordings of the Maltese iz-zaqq, the local bagpipe powered by a goatskin bellows. Borg enlisted ethnomusicologist Guzi Gatt to reconstruct Maltese folk instruments that had fallen from use and were no longer being made. 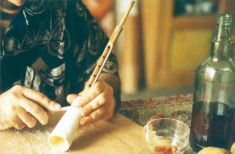 Gatt interviewed peasants, tracked down former players and experimented with local natural materials to produce neo-traditional replicas of the iz-zaqq. The Maltese version has two pipes, each fitted with a single reed; its chanter (is-saqqafa) is made of cane, with a bull's horn fitted to one end as an amplifying bell. Gatt also developed a prototype of the iz-zummara, a reed pipe derived from the bagpipe chanter, but with only a single cane and reed, usually amplified with a cow's horn bell. He went on to reproduce the il-flejguta or il-fifra (cane whistle flute), the it-tanbur (frame drum with a goatskin head), and the iz-zafzafa (friction drum with a ceramic body and goatskin membrane). Borg and Gatt drafted Maltese composer Ruben Zahra to develop a repertoire using these sources. Drawing on his conservatory training in Malta and Italy, including work with Ennio Morricone, Zahra taught himself to play the prototypes and used them in composing the album's music. He is often inspired by North African modes, but as an avant-gardist, Zahra's work also reflects the orchestral conception of artists like Astor Piazzolla, Trilok Gurtu, and Sarajevo rock guitarist, songwriter, arranger and film score composer Goran Bregovic. The latter's eclectic palette of electronic music, string orchestra, gypsy brass band music, and Balkan folk styles is manifest in Zahra's musical approach. Says Zahra, "I have tried to situate Maltese traditional instruments in the contemporary context to create a unique modern soundscape, not a museum piece." Zahra composed the tunes and rehearsed the group, co-producing in the studio with Andrew Alamango. The result is Nafra, an album whose name means to raise an alarm or encourage vigilance via pipe-and-drum music intended to stir people to fight or take refuge. But given stiff local competition, few at first were prepared to heed the call. Malta has a vigorous pop music industry, and in recent years Maltese groups have done well in European song competitions. Zahra notes, "The Maltese media were not originally interested in the Etnika project. There's a tendency to deny Malta's Arabic roots, people prefer to speak English rather than Maltese, and Maltese pop is purely international in inspiration. Nobody knew Maltese folk music." That would change as Etnika cultivated an expanding audience. Zahra relates, "People hadn't actually heard these instruments. When they did, it was a revelation. The music is vivid, not nostalgic. People rallied around Etnika, and the album reached number seven on the Maltese radio hit parade. We were ahead of popular global artists like Sting and Whitney Houston. Etnika plays all over Malta now, and is beginning to get international gigs." So what of Etnika's music? "Preludju" combines the iz-zaqq, it-tanbur and tambourine in a stark invocation of a traditional sound catalog linking North Africa, the Levant and southern Europe. 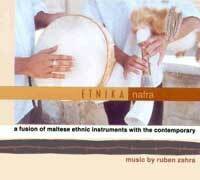 Three tunes ("Grinta," "Harba," "L-Ghanja tal-Mewg") incorporate Arabic melodic modes (maqamat) and Maltese folk sounds as a foundation upon which Zahra mounts a western European configuration of harmony, counterpoint and variation involving clarinet, violin, electric guitar, piano and drum kit. Zahra's sense of musical kinship with Piazzola is also audible in the dynamic quality of these three pieces, as it is on "Raghaj," an explosive work that also has elements of rock, rai and a fleeting theme that is distinctly Sephardic in quality. The album's major pieces are interspersed with interludju (interludes), Zahra's arrangements of the 18th-century Maltese melodies transcribed by Jones. David Grech renders these on solo classical guitar, and indeed, the airy sound is very much 18th-century western European. Of the transcriptions, Zahra observes, "It is somewhat disappointing that Jones rendered the melodies within a strictly Western frame of mind." Etnika's much-changed lineup released their CD Zifna in 2003.